K-I-S-S Means "Keep It Simple, Smarty"
Nothing over-the-top, here. Just a simple site that demonstrates a company's presence on the web. A Salt Lake City Artificial Intelligence development starts up. Artificial intelligence technologies like machine learning and deep learning are rapidly changing the face of the world. From the image recognition and natural language processing capabilities built into Google's search engine, to the face recognition systems used daily at Facebook, to Apple's virtual voice assistant Siri, AI is being used to simplify our lives and improve customer experience everyday. 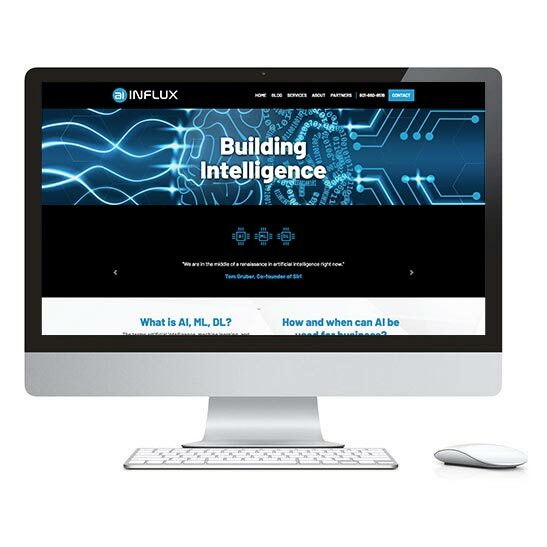 AI Influx is a software development company that specializes in artificial intelligence applications looking to help small businesses, charities, and research labs learn how to employ these rapidly evolving technologies. This simple responsive website is just the first itereation of an online presence. As the company's portfolio of work inevitably grows, the site will demonstrate a suite of case studies and capabilities.